Adored during the 1930s, I can only wonder what he’d say today. History rarely works out as expected, especially when it comes to the perspective you need to profit from it. Society, of course, doesn’t think this way, which is why our lives are filled with information “everybody” knows is true – but really isn’t. … relish privacy and protest vigorously when it’s threatened, yet have voluntarily created the single largest, most accurate, and most valuable marketing databases in mankind’s history using social media platforms like Facebook, Instagram, and Pinterest. … complain about fake news and free speech because they interfere with the freedom of individual expression, yet support censorship when it comes to views we don’t share ourselves. … want change, yet immediately seek to preserve the status quo when it happens. 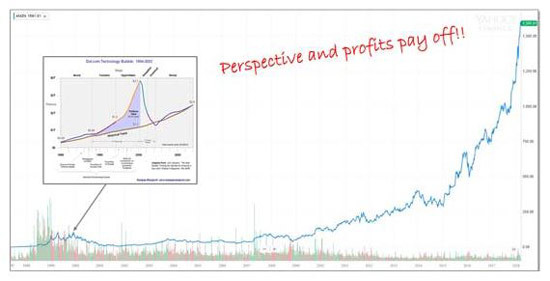 … desperately seek big profits yet complain that stocks are expensive. Dr. Art Markman, professor of Psychology and Marketing at the University of Texas at Austin, says that this is because of the way our brains process, store, and retrieve knowledge. Not surprisingly, that’s where I get interested from a financial perspective. Let me explain why it’s worth millions to investors who understand why it works and how you can use it to find ginormous winners. Most investors go out of their way when it comes to the obvious. That’s why “top 10” lists, annual reviews and the like are so popular. Yet, the biggest and most profitable opportunities are often hidden in the inherent contradiction between things “everybody” knows are true and the way the “herd” thinks about their money. These men aren’t doing anything different than the “herd.” They’re human, too, which means that they see the same things most investors do. It’s how they view things – meaning how they process the information in front of them – that allows them to identify enormously profitable investments. For lack of a better description, they see the same things most folks do but have a different perspective. And, not surprisingly, that’s a crucial distinction. It doesn’t matter whether you’re talking about your favorite stocks or your favorite potato chips. Perspective based on what we think we know drives behavior, even when what we “know” isn’t necessarily true. Take your favorite Internet memes, for instance. 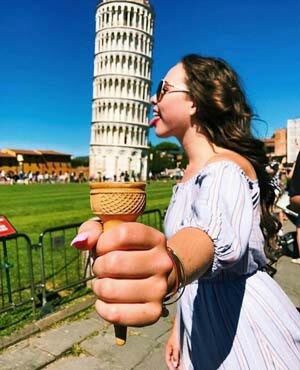 Everybody knows the Leaning Tower of Pisa isn’t an ice cream cone, but this shot from Michigangirlinpearls (of Instagram) makes you think twice. 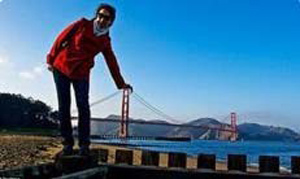 Similarly, people know that you can’t really lean on the Golden Gate Bridge, yet chuckle when they see shots like this one because it’s so unimaginable that it’s funny. So, what happens instead is that our brains try to sort out the inconsistencies by placing contradictions in context. That’s why comedy, satire, political discourse, and pictures like these are so entertaining. Which brings me back to your money. Placing contradictions in perspective and learning to get around how others “see” them is how you uncover investment opportunities other cannot see or even, for that matter, imagine. Combine that with rules about which stocks to pick and when to make your move, and you’ve got a far bigger chance of winning than most people believe is possible. We talk about the company frequently because it’s got great potential and is one of a handful of corporations truly capable of changing the world we live in. 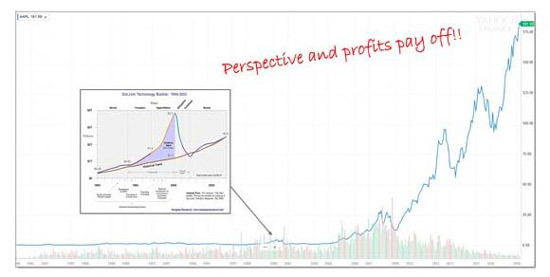 Most investors “knew” Apple was in a bubble back in March 2000, just before the “dot.com” crash, an event I refer to as the “dot.bomb” because of the impact it had on many folks. Put another way, those very same investors “knew” that stocks couldn’t go any higher and, to paraphrase my grandfather John Fitz-Gerald, that was that because of their perspective. Every $1,000 invested in Apple at inception is worth nearly $600,000 today. The “expensive” shares everybody was so concerned with were nothing more than a speed bump in market history, and a very minor one at that. Amazon.com Inc. (NasdaqGS:AMZN), another company we talk about frequently, is much the same story. Team Bezos went public at $18 a share in 1997 and hit an unimaginable high of $113.00 on December 9, 1999 for a 527.78% return, according to Yahoo! Finance. Every $10,000 invested in Amazon is worth $3,182,653, as I write. There are literally dozens of other companies and examples I could point to but I don’t want to waste your time. Learning to see through them can give you perspective worth millions if you know which companies to buy and when to make your move. Everything else that happens in the meantime is just risk management. Take NVIDIA Corp. (NasdaqGS:NVDA), for example. The company is one of the best ways to play both artificial intelligence, autonomous vehicles, and cryptocurrencies because of the graphic processing units (GPUs) it makes and the market share it enjoys. Right on cue, many investors are letting their “protected values” hold ’em back. The stock has appreciated a whopping 1,477% in roughly four years turning every $10,000 into $157,649.68. Trapped in their own biases, many simply cannot imagine the stock going higher. “What goes up must come down” goes the reasoning – or something along those lines. Nvidia is one of ’em. The company has such a commanding lead in the markets it serves and makes such crucial, must-have technology, that it will be “worth” far more a few years from now. In fact, I bet that $212.30 will appear downright cheap in the rearview mirror. Obviously, there are going to be ups and downs along the way. That’s always the case, which is why you want to be constantly thinking about offense rather than defense. To me that means answering the question of how to buy cost effectively. Regular investors could buy shares and implement a series of Trailing Stops to harvest profits and manage risk. More cautious investors might prefer to use Total Wealth Tactics like LowBall Orders or Dollar-Cost Averaging to nibble in. Either way, they harness volatility instead of fearing it like most investors do. More aggressive investors could use blend of options to accomplish the same thing by selling puts as a meaning of “buying” shares, calendar spreads or even LEAPs options as ways to maximize returns and minimize risk. In closing, I hope you’ve enjoyed today’s column. Talking about psychology is a little outside our normal range but it’s very important when sentiment is the way it is right now. I don’t ever want you to be caught by surprise. Speaking of which, I’m tracking more than a dozen companies just like Nvidia at the moment – all of which are ripe for breaking through the “protected values” we’ve just talked about. And, I’ll be back soon with a look at how you use ’em to get around the next correction. I agree! I discovered NVDA at 40 per share! And I have lost it twice due to my stop loss being too high. 25% seems too high, so what kind of stop loss do you put on NVDA when you know that you will only buy it again?